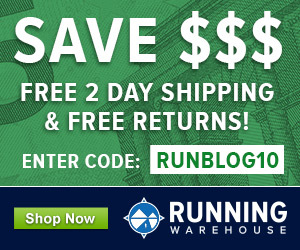 Every once in awhile I like to scan through the brand pages on Running Warehouse to look for pre-order shoes. It’s a good way to keep tabs on new stuff coming out in the coming months. In my most recent perusal, I came across a few models that might be of interest to Runblogger readers. I’ve broken this post up into 4 parts by brand. 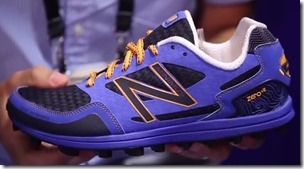 In this post I cover Altra previews, and in parts 3-4 I cover Newton, New Balance, and Hoka. 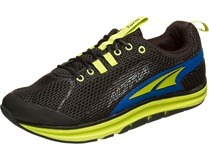 I still have not run in the Altra Lone Peak, but that may change with the forthcoming release of the Lone Peak 2.0. The Lone Peak 1.5 took top honors in my reader survey of favorite trail shoes last year, and the 2.0 is a great looking shoe (I’m partial to yellow shoes…). 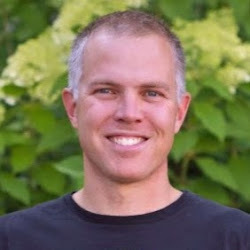 RW hasn’t posted any specs on this shoe yet, but Ben Luedke over at Running the Cascades describes them: “…they are a significant step forward from the first two versions. Gone is the protruding mud flap, and the cavernous toe box. These have a more form fitting, yet generously sized toe box, and more cushion. They aren’t as firm in the midsole as the previous versions, but nowhere near as cushy as a Hoka or the Altra Olympus.” Check out Ben’s post for more info. MSRP for the Altra Lone Peak is $120, and release date is July 2014. When Altra decided to overhaul the One, which was essentially the Altra equivalent to a racing flat, and turn it into a much more cushioned lightweight trainer (The One2) I was a bit surprised. It seemed they were getting rid of all of their lower stack-height shoes. My understanding is that Altra felt that the One and the 3-Sum were kind of redundant, and that the 3-Sum would be updated to take the place formerly occupied by both of those shoes. In the Altra 3-Sum 1.5 we do in fact see the 3-Sum moving a bit away from the Tri-style upper (e.g., the 1.5 has a more traditional ankle collar without the high pull-tab behind the Achilles), but it retains features like the speed-lace system and what appears to be a bootie-style design with an integrated tongue. No specs on RW for this one either, but an image capture from an Altra catalogue shared on Slowtwitch indicates 18mm stack height and weight of 8.3oz. Since the original 3-Sum is listed as having a 13mm stack, I assume the catalogue number includes the 5mm insole, but I could be wrong. Interestingly, the women’s 3-Sum 1.5 is listed as having a stack of 24mm, so a bit more cushion in the women’s shoes. As far as I can tell the sole looks to be the same, so this should work well for fans of the original One as well as the original 3-Sum. Not sure I’m crazy about the aesthetic on the 3-Sum 1.5 though. I have not yet come across any reviews of the 3-Sum 1.5. 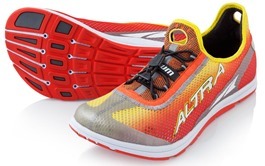 MSRP for the Altra 3-Sum 1.5 is $130, and release date is July 2014. Yes yes on the 3-sum!!! 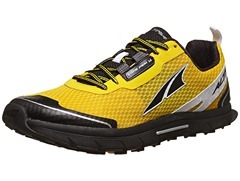 but PLEASE Altra, tone down the colors. We need something more neutral to choose from. I agree, I normally like loud shoes but that one is a bit much. Agreed. The Lone Peak 1.0 is my go-to shoe for aggressive hikes and longer trail runs. But I hate how they look — the mountain silhouette looked like a manufacturing error and adds useless material, and I prefer muted blend-into-the-scenery colors when I’m on trails. At least they dropped the mountain silhouette on this new version, and the overall shape is more pleasing and foot-like and will hopefully feel better-secured to my foot when I’m moving fast. Those changes will probably be enough to get me to buy a new pair. But those colors will be hard to stomach. Haven’t seen the new Instinct Jr., but the v1 has been incredibly durable so hope they don’t change it too much! 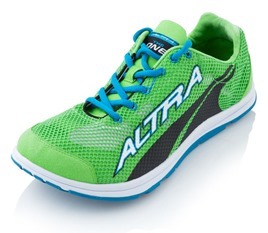 Hey Pete- wanting to try a new shoe (wide forefoot, low h/t drop, lightweight) and thought about the Altra. Just can’t decided on which one; the One2 or the 3-Sum. Mostly road running/racing as I have a trail shoe I love. Tried the new Newts and was disappointed (I used to wear them and loved them till my model changed). Any advice would be appreciated. The One2 is a much softer shoe than the 3-Sum, probably more flexible as well. I prefer that one over the 3-Sum sole (I haven’t used the 3-Sum, but the original One had the same sole) unless I was planning to use it for racing. Since you’re concerned with weight, The One^2 is a no-brainer. It’s the lightest Altra and my favorite of the 5-6 models I own. Just don’t forget to size up a half! The 3-Sum was an awkward fit on me. This is the third version of the Lone Peak and still no protective rand like some Inov-8 and Merrell shoes. 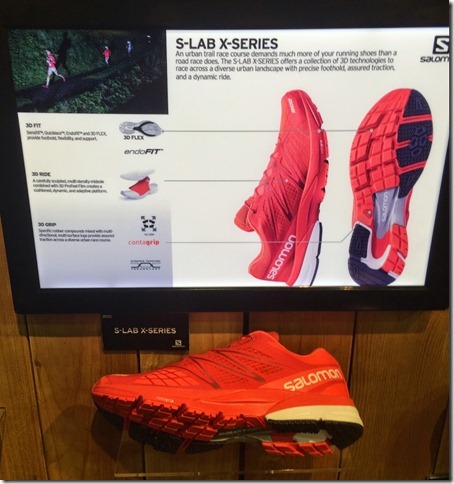 The upper looks like a minimal road shoe. 3sum 1.5’ve released. EUROPEAN my size is 42 (8.5) is uyna shame because I stay small. My big toe constantly clashed with the toe and after 20 kilometers my finger is purple. My consejno to request another number. I read again at a forum this problem Altra.